Travel to Skingrad to receive information from Count Hassildor... at a price. Speak to Traven. He will tell you to go get some information from Count Hassildor of Skingrad. Upon arriving at Castle Skingrad, speak to Hal-Liurz who will bring the Count to you after some time. Go to Bloodcrust Cavern and kill all the vampires. Grab some vampire dust from at least one corpse. Talk to Eridor. Show him the dust, which will convince him and his hunters to leave. Find Eridor and tell him the vampires are at Bloodcrust Cavern. Wait for the hunters to go to Bloodcrust, and help them kill the vampires. Once all the vampires are dead, talk to Eridor. If he is dead, your only option at this point is to kill all the remaining hunters (if any). Go to Bloodcrust Cavern and kill all the vampires. Use the compass to find and kill the Vampire Hunters. Talk to Eridor and tell him that there are vampires in Bloodcrust Cavern. Enter Bloodcrust Cavern after your journal says they have been killed. Talk to Hassildor to get his information. Return to Traven to give him the information. Once you have been promoted to Warlock, speak to Traven for your next task. Count Hassildor of Skingrad has personally requested that you go see him to retrieve some vital information regarding the necromancers. Traven stresses that the good relationship between Hassildor and the guild must be maintained. Travel to the Castle Skingrad and arrange an appointment with Hal-Liurz - the Count's new assistant - in the County Hall. She says that he has been expecting you and will tell him of your arrival immediately, unless you have done the Vampire Cure quest and encountered the bug where Hal-Liurz gets stuck in the Chamber of the Lost, in which case you will have to go and find the Count on your own. If not, wait for her to return with the Count. If she doesn't return soon, and your compass indicates that she's traveling towards Kvatch, go to the map marker. The Count will be there, and you can continue with the quest. Now ask Count Skingrad about Information to learn why he has called you here. Apparently, your last encounter with him earned his trust—most of it anyway. He wants you to perform a task before he will give you the information. Hassildor says his problem is a minor one, but he doesn't want himself or his guards involved. It seems that a group of vampires has taken up residence in Bloodcrust Cavern to the east. In addition, rumors have spread that vampire hunters have come to town to take care of them. Both of these groups present a problem to the Count, and he wants them dealt with. Upon further questioning you'll learn there are four Vampire Hunters, led by a supposedly highly skilled Wood Elf named Eridor. Count Hassildor doesn't care how you deal with this second group as long as he himself is not implicated. There are a few ways to handle this problem: kill the vampires and convince the vampire hunters to leave; send the hunters to Bloodcrust Cavern (optionally assisting them) and clean up anyone that's left; or just kill both groups yourself. If you feel like killing the vampires alone, just head over to Bloodcrust Cavern and wipe them out. After they are all dead, grab some of their vampire dust. Then find Eridor (he will be the vampire hunter that is in Skingrad if you are using the compass). Talk to him about the vampires and show him the dust and he will agree to leave. First, you'll have to let the hunters know where the vampires are, and probably help them out a bit once they get there. Talk to Eridor and let him know the vampires are hiding out in Bloodcrust Cavern. If you want to ask him any questions, you'll need to raise his disposition. This is not necessary however, as he only tells you information you already know. The hunters will set off for Bloodcrust Cavern the following midnight once they've been given the information. The hunters are always equipped with leather armor and steel weapons, whereas the vampires' weapons and spells are level-dependent. The hunters are also significantly outnumbered, so at anything except extremely low levels the hunters' chances of winning are very slim. You'll receive a quest message if all the hunters are killed. This takes care of the first task if you are going for total obliteration of both groups. Continue on with or without the hunters, clearing the cave of the Bloodcrust Vampires. It isn't too big and once you kill all the Vampires you'll get a quest message. If Eridor survived, and you have dust from at least one of the vampires, talk to him and the group will leave town. This is essentially the same as the first option, but provides you with some support. Unfortunately, if Eridor does not survive, the only way to get rid of any remaining Hunters is to kill them all. If the hunters do manage to kill the vampires, you'll have to take care of the hunters yourself. Once again, just go to Bloodcrust Cavern and kill all the vampires. After that, use the compass to find and eliminate the vampire hunters. If you choose this path, these tips may help. Once all of the vampires and hunters are taken care of, return to the Count with the news (speak with Hal-Liurz again to arrange a meeting). Count Hassildor will finally tell you the information he has for the guild. He says the necromancers are but a sign of things to come and the Mages Guild is in great danger. It seems that Mannimarco—the nearly invincible leader of the Necromancers—has returned. Return to Traven and tell him the bad news. He will say that the Council needs to deliberate on this matter. As such, you won't be able to get a new task for a few days. You must finish any business you may have with the Bruma Mages Guild before starting the next Mages Guild quest, as something will happen then that significantly disrupts things there. This mostly concerns Volanaro, who is the only vendor in the game that sells the Summon Dremora Lord spell. If you are a conjurer or ever plan on mastering the skill, it is recommended that you buy that spell in advance. If you have the Spell Tomes mod installed, you may find a "Summon Dremora Lord" spell tome. Similarly, Selena Orania will no longer be available as a vendor, so if you intend to invest in every store in the game, this is your last chance to do so. Mog gra-Mogakh at the Two Sisters Lodge will tell you that the hunters are staying there if you ask her, but this is not a required step in the quest. The vampire dust that you pick up from the vampires in Bloodcrust Cavern cannot be traded for gold with the Order of the Virtuous Blood, although it can be turned into regular vampire dust using the Arch-Mage's Enchanted Chest and then sold. Be careful when killing the vampires to keep them all in the cave. In other words, avoid leaving the cave when one of the vampires is chasing you. Vampires that leave the cave have been known to end up wandering far off and it may not be possible to ever find them and kill them, in which case the quest cannot be finished. If you convince the vampire hunters to leave, they actually remain in Skingrad forever, although the Journal states that they have left. If you have the vampire cure mission from the count you may not be able to complete this mission until you complete the vampire cure mission. If you kill the vampires on your own after talking to Eridor about them, you will be unable to subsequently convince him to leave. Thus, you must kill him. To avoid this, wait until you notice the map markers of the hunters in Bloodcrust Cavern, and then proceed to either help them, murder them, or let them be killed by the vampires. The AI package required for the hunters to actually hunt the vampires is driven by the acquisition of the unique Vampire Dust they possess. This can cause them to start stealing from one another during breaks in combat, and eventually lower their dispositions to the point that they attack each other. While this can be helpful when trying to eliminate the hunters, it's less so if you want to keep them alive. The best way to avoid this problem is to simply keep them in combat by drawing the vampires to them when needed. They will only do this while at least one vampire is still alive: once all 10 have been killed the package will no longer run, so they won't try to steal from each other. If Hal-Liurz previously got stuck in the Chamber Of The Lost during Vampire Cure, she will not leave the room after telling you she will let the Count know you're looking for him. 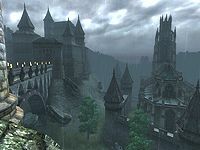 It is, however possible to continue the quest by breaking into the castle and find the Count for yourself, talking to him should cause the quest to continue normally. 10 Count Hassildor wishes to see me; I should travel to Skingrad immediately and speak with Hal-Liurz. 20 Count Hassildor has information that he will provide only if I remove the Vampire Hunters lurking around Skingrad, as well as a nest of vampires in Bloodcrust Cavern outside of town. 40 The Vampire Hunters in Skingrad have been killed. 60 Count Hassildor's news about Mannimarco must be delivered to Hannibal Traven right away. 100 Finishes quest I have told Arch-Mage Traven about Mannimarco's presence in Cyrodiil. It is possible to use the console to advance through the quest by entering setstage MG13Information stage, where stage is the number of the stage you wish to complete. It is not possible to un-complete (i.e. go back) quest stages. See SetStage for more information. Esta página foi modificada pela última vez à(s) 16h57min de 8 de outubro de 2015.